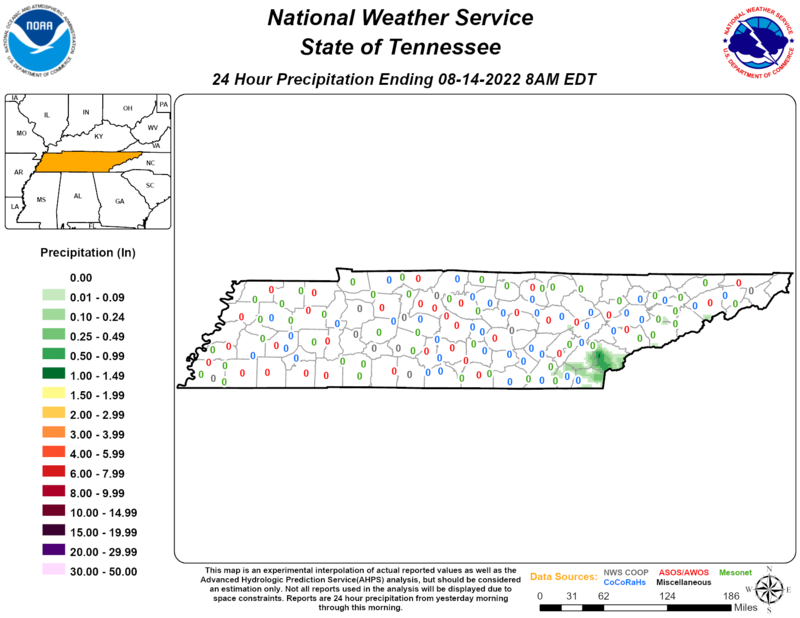 WELCOME TO THE VOLUNTEER STATE CoCoRaHS PAGE! We started April 1st, 2007, with hopes of being able to supplement precipitation observations across the state. All expectations have been exceeded, surpassed, and left in a cloud of dust! Thanks to each of you, the program is vital and healthy, and providing useful and valuable precipitation data to many users in the state and nationally. A very special thanks is also due the University of Tennessee Institute of Agriculture and the USDA Farm Service Agency for all their help. Along with the phenomenal growth comes a few growing pains. Here are suggestions on how to avoid some of the most common reporting errors. Multi-Day Accumulation Report MDAR. If you are doing a MDAR, remember that the dates are the first and last date of the period you are reporting. If the dates overlap a previous report, your precipitation will not automatically record in your station summary. Preset precipitation amount. The precipitation amount space is preset with 0.00. Don't forget to change this value to the amount of precipitation you are reporting. If not changed, the precipitation value submitted will be 0.00. It's always a good idea to click on View Data and Daily Precipitation Reports to check that your report got into the system. It also shows up immediately on your Monthly Zeros report. Reporting Period. The daily reporting period is from 7:00 a.m. to 7:00 a.m. or as close to that 24-hour period as possible. An example, the January 4 report is from 7:00 a.m. on January 3 to 7:00 a.m. on January 4. Don't try to make your report match the calendar day that the rainfall occurred. You can also make Daily Precipitation Reports DPR for dates other than the current date by just changing the date on the DPR and enter your observations. SKYWARN Spotter Training...please follow the link to your local NWS office. If you have any questions please contact your regional coordinators. and the U.S.D.A. Farm Service Agency.